CRESTLINE — Last season,Crestline’s girls basketball team snapped a losing skid that had haunted them for a long, long time. On Jan. 5, the Lady Bulldogs defeated Mid-Buckeye Conference rival Mansfield Christian 49-34. Unfortunately, that was the only win of the season for Crestline as they finished 1-22 overall and 1-13 in the MBC. For the 2017-‘18 season, Crestline has a new leader and will be without two of its contributors from a season ago. Dennesa Baker and Sarah Toy graduated. Aaron Bluey is out as the head coach for Crestline. Enter first-year head coach Kyle Strauch and a group of girls that are ready to put their current losing streak to bed. Leading the way for Crestline is senior Lydia Tadda. She will be joined by juniors Bri Briggs, Destiny Hoskinson and Alandra Tesso. Two sophomores — Kennedy Moore and Lauryn Tadda — are ready to make an impact. In fact, Lauryn Tadda scored 22 of the 49 Crestline points in their win over Mansfield Christian last season. The Crestline program also has a number of freshmen looking to make the squad or possibly give the Lady Bulldogs a junior varsity team for the first time in five years. Those freshmen girls are: Jeri-ka Cassady, Brynn Cheney, Hannah Delong, Caeley Giron, Kirah Hoskinson, Daija Swell and Ivy Stewart. Crestline’s season starts with a home contest against Galion on Friday, Nov. 24. MBC play picks up on Saturday, Dec. 9 against the Lady Spartans of St. Peter’s. 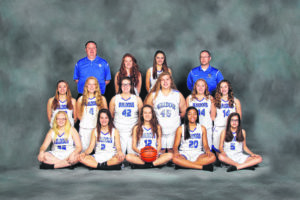 The Lady Bulldogs will be the home team in a game against Bucyrus on Tuesday, Dec. 12. That contest will be played at Quicken Loans Arena in Cleveland, home of the Cavaliers.